This Demonstration illustrates the tangent plane basis and the reciprocal basis at points along a few sample surfaces. The tangent plane itself is shown and a control is provided to alter the position of the tangent plane along the surface. 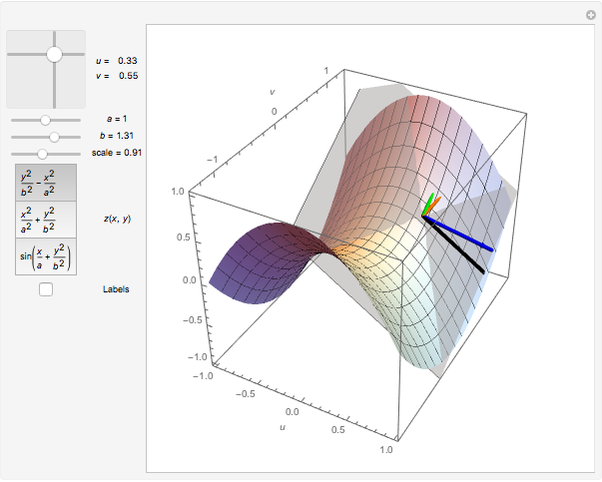 This lets you see the normality of the tangent plane basis vectors and their alternate indexed reciprocal vector. You can also compare the orientations of the tangent plane basis vectors with their reciprocals, and see how these pairs of vectors are not necessarily collinear. 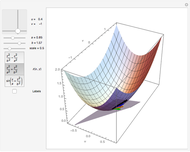 A 3D surface can be represented in a parameterized vector form using two parameters and as . The partial derivatives and with respect to these parameters provide a basis for the tangent plane at the point of evaluation. Because those vectors are not necessarily orthogonal, the reciprocal (or dual) vectors for the tangent plane can be useful for expressing projection operations. These vectors satisfy the relationship , for . 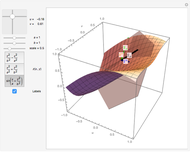 This Demonstration shows both the tangent plane basis and the reciprocal basis for a few sample surfaces, and controls for altering those surfaces. You can use the scale control to adjust the length of both pairs of bases should they range out of the image or be too small for visibility. A control for adjusting the parameters is also provided. or, in 3D using dual cross product representation (also above). Note that the geometric algebra square of a vector equals the squared norm of that vector. Additional background material on the calculation and applications of the reciprocal basis to nonorthonormal coordinate systems can be found in . A. Macdonald, Vector and Geometric Calculus, CreateSpace Independent Publishing Platform, 2012. Peeter Joot "The Dual Basis for the Tangent Space of a 2D Surface"